Order routing and market data access are configured on the Users | Exchange Properties | Order Routing and Market Data tabs. Additional settings for reporting market data access are also provided. When you click the Exchange Properties tab, Setup defaults to the Order Routing tab. In Setup, each CME Netting Program Participant for market data access is identified as an 'organization'. You can set a user's Netting Program Participant per market data group by selecting an existing participant or creating a new one. They can also use the Manage Organizations tab to manage a list of CME Netting Program participants. A user that participates in the CME’s netting program is billed directly by CME. Trading Technologies still reports this user's market data access to the exchange, but reports them as non-billable. By default, no organization is selected. For a list of exchanges and supported products when allowing or denying Market Data access for a user, refer to the CME Group website. Click the Users | Exchanges tab for a user selected in the data grid. Click the exchange list drop down arrow, and scroll to and select an exchange. Use the Subscriber Market Data tab to allow or deny the user access to all market data per product group. 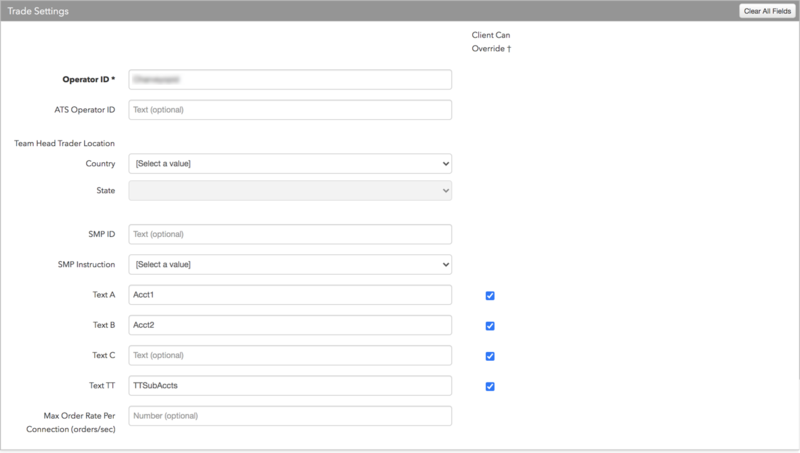 Use the Order Routing tab to configure exchange credentials for user identification. Use the FIX Market Data tab to allow or deny the user access to all market data through TT FIX per product group. Operator ID — Identifies the user in Tag 50 on all manual order actions sent to the exchange. Users must register the Operator ID with the exchange. ATS Operator ID — Identifies the user in Tag 50 on all automated order actions sent to the exchange. Users must register the ATS Operator ID with the exchange. SMP ID — Sets a Self-Match Prevention Identifier (SMP ID) for the account. An SMP is optional and allows an executing firm to prevent the matching of orders for accounts with common ownership if both the buy and sell orders contain the same SMP ID and Executing Firm ID. Sent to the exchange as Tag 7928. Cancel resting — Cancels the resting order and sends the aggressing matching order to the exchange. Cancel aggressing — Leaves the resting order in the market and cancels the aggressing matching order. Text A — An optional, user-defined text value that remains on submitted orders in the TT system, but is not sent to the exchange. Alpha-numeric and special characters are allowed. Text B — An optional, user-defined text value that remains on submitted orders in the TT system, but is not sent to the exchange. Alpha-numeric and special characters are allowed. Text TT — An optional, user-defined text value that remains on submitted orders in the TT system, but is not sent to the exchange. Alpha-numeric and special characters are allowed. Max Order Rate — Sets the maximum number of orders per second that a user can enter per connection. This limit cannot exceed the exchange-defined order rate maximum. For Sessions, set how many simultaneous market data sessions per product group the user can have active using different IP Addresses/Applications. Selecting Delay Only indicates that the product group is denied in all environments except the delayed environment, which does not have access to real-time market data. For Netting Program Participant, set whether the user participates in the CME’s netting program for the product group. Click the selector and select the name of the user’s CME Netting Program participant organization. This is typically the user's company name, but could be a specific group within a company that has an agreement with CME. Manage Organizations — Click Manage Organizations to open the Organizations tab and add Netting Program Participant organizations to your company. You can also edit organizations or view which product groups are approved for the exchange netting program. For Sessions, set set how many simultaneous market data sessions per product group the user can have active using different FIX users. Selecting 0 - Security Definition & Status Only indicates FIX users can access only security definitions and securty status updates for the product group. Non-Professional — Sets whether the CME market data user is considered a "non-professional" trader for CME billing purposes. When this setting is enabled, the CME non-professional self-certification agreement is sent to the user's Agreements tab for the user to sign. The status "Pending Verification" is displayed until the agreement is signed. This checkbox is unchecked by default. Note: To maintain non-professional status, the user must remain in compliance with the CME non-professional rules as defined in the non-professional self-certification agreement. Users who are not in compliance will be billed by CME at the professional rate. Support Waiver — Sets whether this user has a Support Waiver granted by a specific agreement with CME. When this setting is enabled, the CME Support Waiver Request form is sent to CME for approval. The status "Pending Verification" is displayed until CME informs TT administrators that the form is approved. This checkbox is unchecked by default.